Prase Media Technologies, an Italian distributor of AV brands, has supplied the audio system for the Djamaâ el Djazaïr Mosque located by the Bay of Algiers. 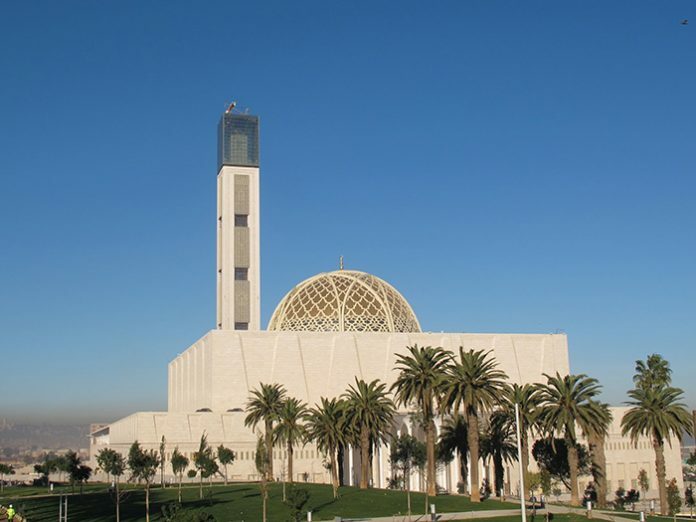 Also known as the Bouteflika Mosque, it will be the third largest mosque in the world when it opens in 2019. The gigantic building covers 20 hectares and is designed to welcome 120,000 faithful. Its 270 meter minaret is the highest building in Africa and the world’s tallest minaret. Architects Drees & Sommer worked with Jürgen Engel Architekten and the engineering consultancy Krebs und Kiefer on the project, with AV integration by Advantex and CSCEC (China State Construction Engineering Corporation Ltd). With an area of 100 meters by 100 meters, the Cour required four Community R6-51BIAMP 6 by 12-inch high output, three-way, vertical array loudspeakers. Each loudspeaker is capable of delivering 138 dB SPL continuously over the range of 50 Hz to 16 kHz, with pattern control to below 200 Hz. Eight R6-51BIAMP loudspeakers also cover the 300 by 100-meter area of the Esplanade. Here, each loudspeaker is built into the capital of the building’s columns that line the perimeter of the area. Millimetre precision of the loudspeaker recesses provided for discreet fitting with minimal aesthetic impact. For the area surrounding the mosque, two line arrays, each comprising four R2-MAX loudspeakers, are built into each of the four faces of the Minaret. These thirty-two loudspeakers provide 360-degree coverage for up to 2/3 kilometres from the tower. The R2-MAX features powerful 1.4-inch exit HF drivers, high-performance M200HP midrange drivers and 600W neodymium woofers, delivering well-behaved coverage patterns, exceptional intelligibility and flat frequency response. As with the Esplanade, precision fitting into custom recesses ensures the loudspeakers are unobtrusive. Additionally, they are painted a custom tone of white to closely match the marble face of the tower. To complete the system, Prase Media Technologies also supplied Biamp Tesira Fortè DSP, Lab Gruppen D120T amplifiers and Extreme Networks switches for the high-performance Ethernet network.